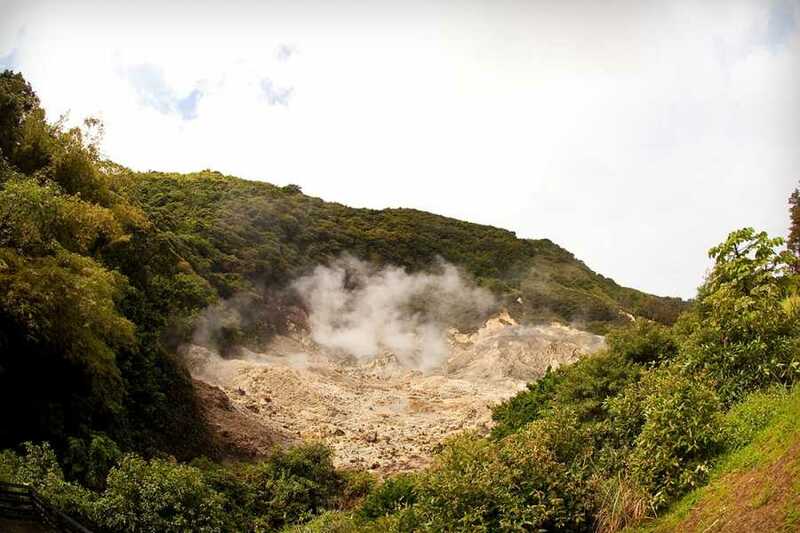 Soufriere Volcano in St. Lucia is considered as the only “drive-in” volcano in the world! It is locally known as the Sulphur Springs. 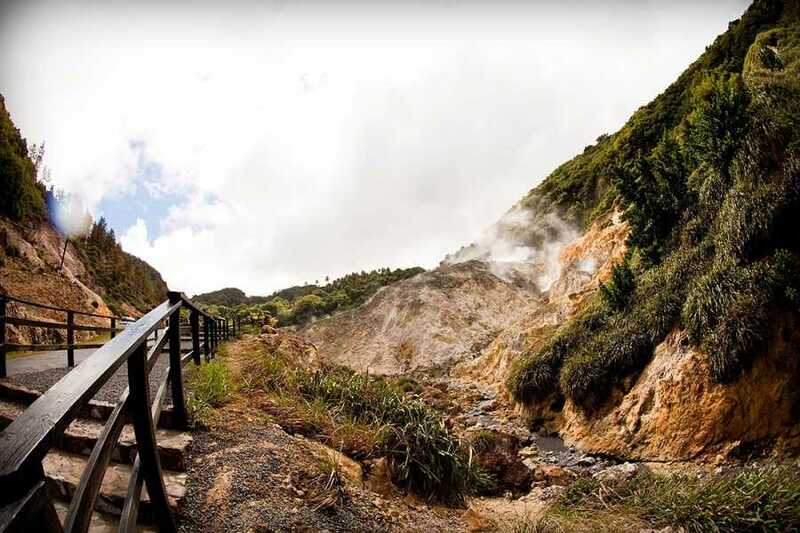 Now a major tourist attraction in St. Lucia, the road runs right up to and through the crater of the volcano, which emits steam and sulfur with boiling mud and water bubbling away just a few meters from the tourists. Be prepared for the smell of rotten eggs! 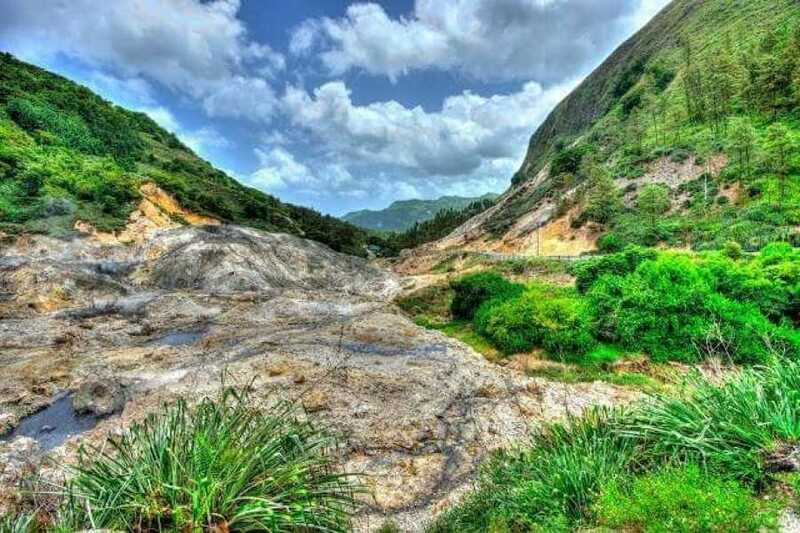 Soufriere Volcano in St. Lucia is considered to be dormant, and its last eruption occurred in the late 18th century, unlike the highly active volcano that goes by the same name, Soufriere Hills Volcano, which is located in the island of Montserrat. At the Sulphur Springs, you are allowed to walk behind a wooden fence, which would appear to offer absolutely no protection if ever the volcano erupts. But don't worry about the eruption, because as mentioned earlier, the Soufriere Volcano is now dormant. During the early times when the tourist attraction was first opened to the public, visitors are allowed to walk over the crater which is covered in a thin crust. But an incident occurred when one of the volcano guides fell in. And so now, visitors are requested to stay behind the fence. At the Sulphur Springs, there is a stream running through the crater, and a little further down are well-established hot springs and mud baths hotter than the average bath. These bathing pools are blessed with volcanic minerals and health-giving properties, which are reputed to have therapeutic qualities for the skin, the reason why the volcano attracts many tourists. You may not like the smell coming from the spring, or stand the heat for long, but your skin will thank you after a quick dip. The bus first passes through the bustling city of Castries which consists of the colourful market place and the Immaculate Conception Cathedral, with its magnificent paintings, completed by our famous local artist, Dunstan St. Omer. A panoramic view of the island can then be seen from Morne Fortune before you travel through the lush Cul de Sac and Roseau banana plantations on to picturesque Marigot Bay of movie fame. Continuing your scenic drive along a winding road on the edge of a rainforest, where there is an abundance of tropical flowers and trees, you then reach the town of Soufriere. Here, the dramatic Pitons, rising more than 760 metres (2,500 feet), tower over the entire area. You will enjoy a short guided visit of the Sulphur Springs, the worlds only drive-in volcano, so called as you can drive right into the crater to see pools of bubbling lava! A refreshing drink awaits, served in a unique atmosphere at the Volcanic Restaurant Next, you will visit the Maranatha Garden or Prayer Park, where an array of exotic and brightly-coloured specimens of flowers, fruit trees and colourful birds mingle to form a perfect setting for garden-lovers and picture-takers! . Please note: Minimum age participation is 3 years. Travel traverses bumpy and winding roads. Guests suffering from motion sickness must take adequate precautions. The scenic drive to Soufriere takes approx. 1.5 hours. Guests must be able to walk over uneven surfaces and climb steps. Imagine visiting the eighth wonder of the world an actual active volcano that you can drive right into. During this St. Lucia volcano tour, you'll travel through the quaint fishing villages of Anse La Raye and Canaries on to the banana plantations. 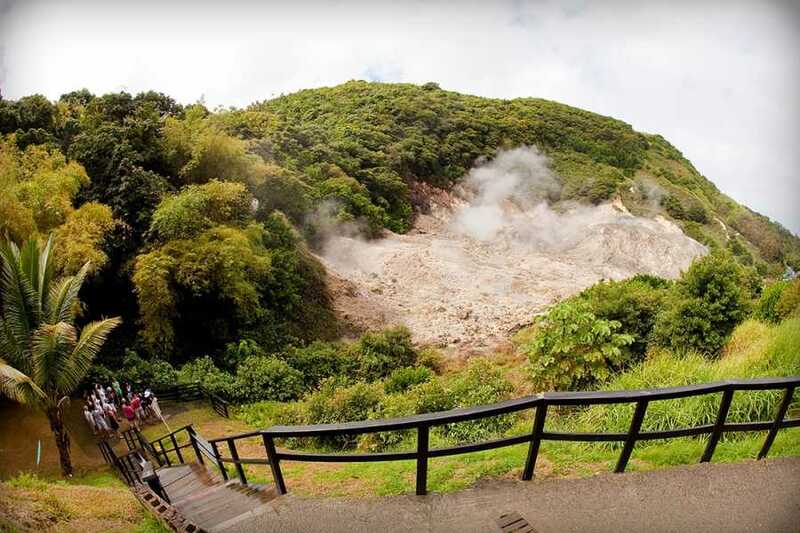 You'll arrive in Soufrière (the old capital of Saint Lucia) and visit the world famous Sulphur Springs “drive-in- volcano.” On the way back, you'll proceed to the lookout spot for a photo op of the picturesque Marigot Bay. This St. Lucia drive-through volcano tour is an excursion that you won't want to miss. 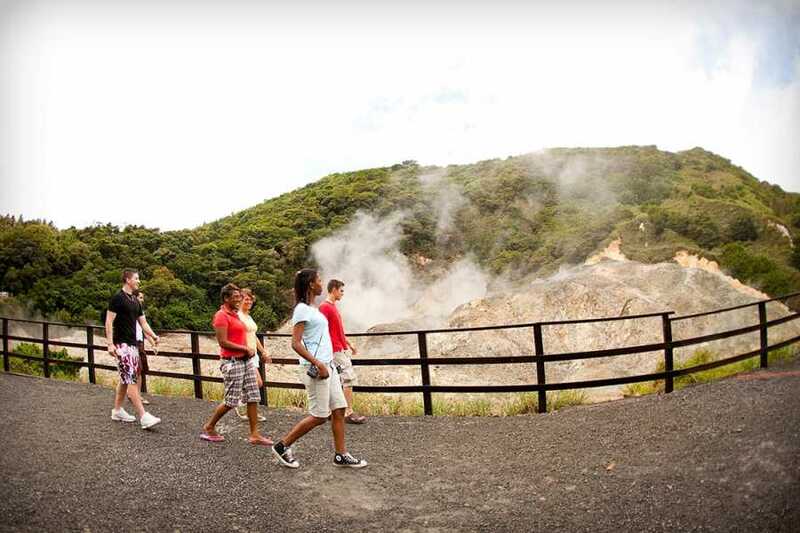 Visit the Sulphur Springs "drive in volcano"